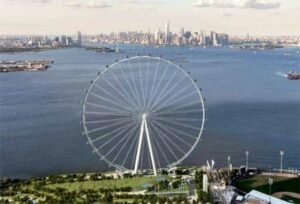 The New York Wheel is a huge ferris wheel at Staten Island’s St. George waterfront. It’s part of a large project that is supposed to put Staten Island steadily on the map, and it is scheduled to open in the spring of 2018. 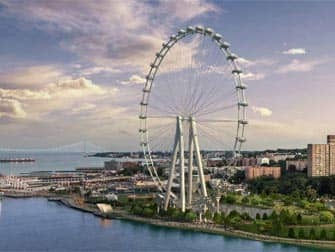 Being the tallest observation wheel in the Western hemisphere, it provides a spectacular view of Manhattan, New York Harbor and the Atlantic Ocean. The 38-minute ride in the New York Wheel is truly spectacular. Whether you want to have a clear view over the city in the middle of the day, or a romantic scene looking out over all the city’s lights by night, it will definitely be a ride to remember. The Wheel is open seven days a week, from 10:00 till midnight, and on special occasions even until 02:00. This means The Wheel can entertain up to 30,000 people per day. 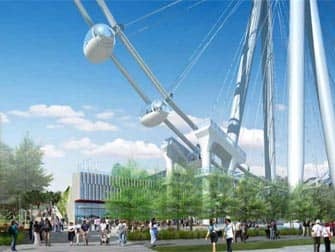 The New York Wheel is inspired by the London Eye, but New York wouldn’t be New York if they wouldn’t have done it ‘slightly’ bigger. To compare: the New York Wheel stands 192 meters high, while the London Eye is ‘only’ 135 meters tall. And the New York version features 36 capsules, each carrying up to 40 passengers, while the London version features 32 capsules that hold a maximum of 25 people each. While at the St. George waterfront, the fun doesn’t have to stop after your ride in The Wheel. Visit the terminal building next to The Wheel, for example. This place is used for educational and digitized exhibitions on New York City history and alternative energy. More of a fashion fanatic? Lucky you! Together with The Wheel, the Empire Outlets are being built: New York City’s first designer outlet. And at night, the New York Wheel will produce a harbor lights show. 8 million dollars were spent on LED lights alone, so you can sure expect this light show to be breathtaking!